If you’re a frequent Walker visitor you’ve maybe met John Greenwald. He’s one of our guards and is often poised to greet people as they enter the art center by the Garden Café, or encourage them as they breathlessly but enthusiastically reach the final brick steps that carry one from the 1971 building to the 2005 expansion. When he’s not present in one of the Walker’s public spaces he’s in the galleries to, as he says, “protect the art from overly enthusiastic viewers.” John’s kind and always game for humor. Something that I learned recently about my colleague is that he’s had a 24-year relationship with Courage Center—participating in the organization’s Transitional Rehabilitation Program and Vocational Services. It was Courage Center that helped link John to Common Sense Building Services, the company that provides the Walker with its great team of guards. Courage Center has also been a great partner to the Walker’s Education and Community Programs department over the years, assessing the work we do and offering suggestions for making it evermore inclusive. To learn more about John and what lead him to the Walker, take a look at Our Stories: John Greenwald, a recent profile in Courage Center’s May newsletter. 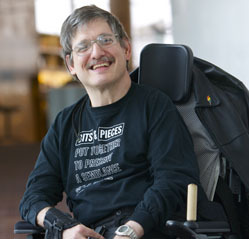 And the next time you’re at the Walker seek out John and chat him up about an artwork you encounter during your visit.